Depending on which source you depend upon, bees are either cute little creatures or the pillar upon which the survival of the human race stands. 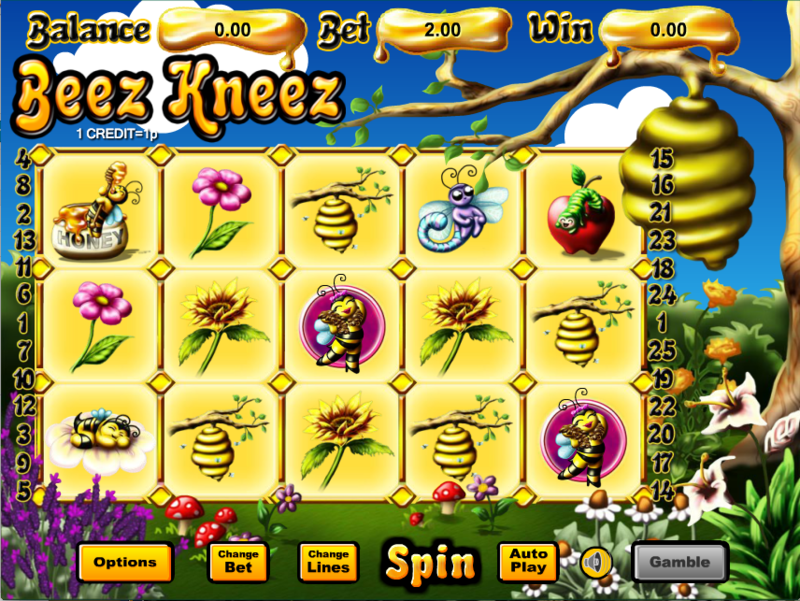 Either way they produce some decent honey and they are also the stars of this online slot from Eyecon; it’s called Beez Kneez and it includes two bonus features as well as an opportunity to gamble your wins. 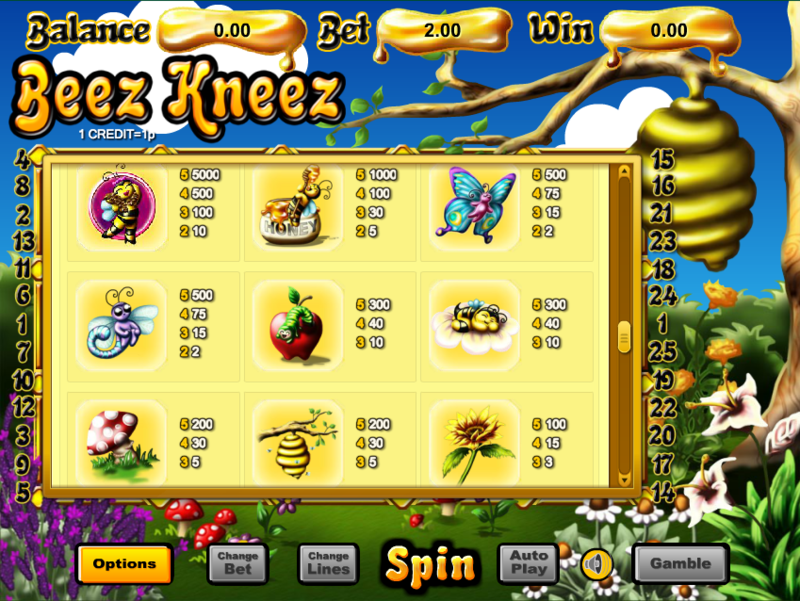 Beez Kneez is a five reel slot with three rows and up to twenty five paylines; the reels spin within a golden frame set against a backdrop of a beehive hanging from a branch, blue skies and green fields. All the symbols are related to the theme and include bees in various positions, butterflies, flowers, apples, mushrooms and beehives. The wild symbol is a blue cocoon and it substitutes for everything else except the worker bee scatter icon. This feature is triggered by landing three or more of the worker bee scatter symbols anywhere in view; you will now be taken to a screen displaying a number of pink flowers and you get to pick the same number as the number of triggering symbols. Each is worth up to 100x your total stake. During the spins all prizes will be subject to a 3x multiplier and it’s also possible to re-trigger the spins by landing three+ more wild cocoon symbols. Each win can be gambled by clicking the ‘Gamble’ button below the reels; you now get to play a double or nothing picking game with a maximum win of five correct picks of 3,200,000 coins. For the sake of your bankroll and your sanity, avoid the gamble feature – it’s the quick way to run out of money. Beez Kneez has a lot to offer for a slightly dated game including some cute animal graphics and two regularly triggered bonus features. Worth checking out.